Welcome to the premier pre-professional music theatre program in the city. It’s time to rethink the possibilities of youth theatre. Are you interested in AUDITIONING for one of our four, Advanced Music Theatre Troupes for the 2016/17 year? Here is all of the info that you need to know! 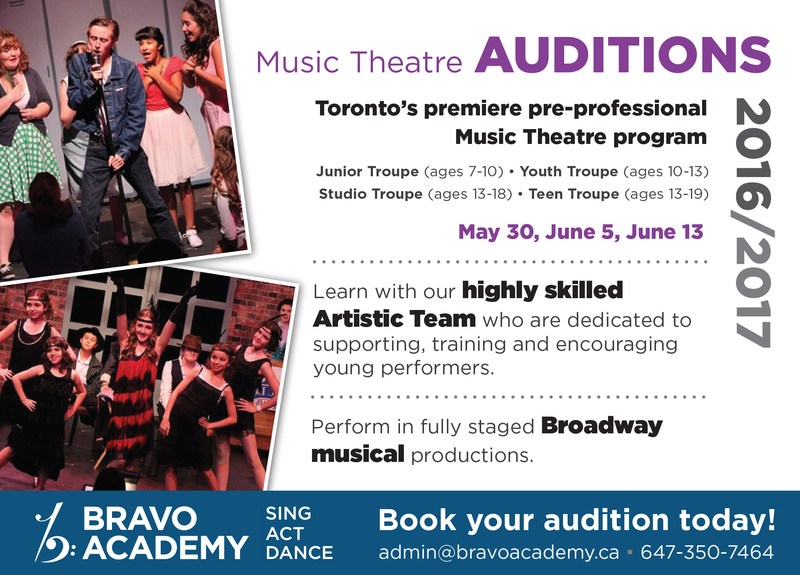 Book an Audition Time: Contact admin@bravoacademy.ca or 647-350-SING to book your audition today! Resume and Headshot or Photo (will not be returned) must be brought to the audition. Please come early to fill out an Troupe Audition Form 16-17 or print and bring with you. Resume and Headshot (will not be returned) must be brought to the audition. Please come early to fill out an Troupe Audition Form 16-17 or print and bring with you. Bravo Academy’s Advanced Music Theatre Programs are Troupes for the most dedicated young performers. Four ensembles, spanning ages seven to nineteen, present two showcases and six full-scale musicals a year. Our highly skilled Artistic Team supports, trains and encourages young performers to new be the best they can be. Ensembles rehearse in the state-of-the-art Studio Theatre in our brand new facility.